The County Commissioners, on 7 July 1824, advertised for proposals for erecting a stone jail. The dimensions were to be 35x50 feet, 2-stories high, with walls that were 2-1/2 feet in thickness. The lower story was to have 4 rooms and the upper story was to have 6 rooms. The final cost of the building was $2,600. On 1 October, 1827, a stone wall enclosing the jail yard was constructed. This original jail, with slight improvements/alterations, was used by the county for the rest of the century. Newspaper articles relating to the jail. 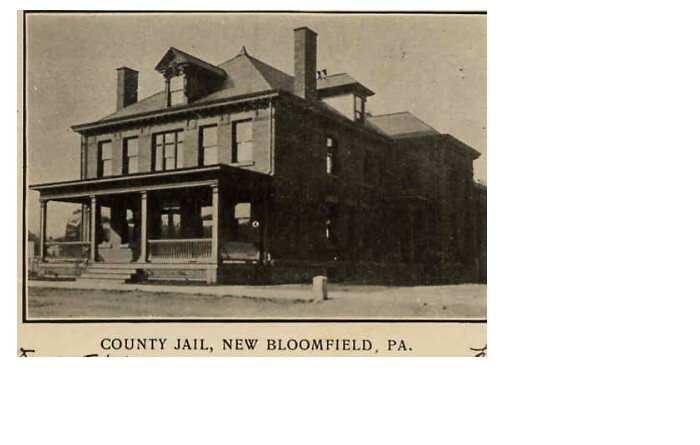 Postcard of the Perry County Jail; New Bloomfield, Pa.